Moving to a new home is exciting, and it’s expensive. Aside from the initial costs of purchasing a new home, there are lots of supplies and efforts that go into making your transition a smooth one. If you’re interested in learning more about how you can make your move seamless while also saving a few dollars here and there, keep reading! We’ve compiled a list of ways that you can save money on your next move. While the actual time of year that you’re moving may not affect the cost of the services as much, the time in which you reserve your moving services could, in fact, save you some money. Usually, last minute reservations are going to cost you a little bit more because of the inconvenience. Not only do last minute reservations require the moving company to gather up all of the supplies that they need to get the job done, but it often means that they have a shorter amount of time to get the job done. Working on a time crunch is something that we are entirely capable of doing here at Skyline Moving Company, but it can result in shorter periods of time to get the job done. In order to not only ensure there’s enough time to get the move done in an efficient and organized manner while also saving some money, schedule your moving services in advance. Very few people realize how expensive moving is until they go to purchase the supplies to get the job done. Sure, those boxes may be made from cardboard, and they seem cheap when you look at the price tag, but if you need to purchase enough boxes to pack up your whole house — it adds up. Aside from the boxes that you need to purchase, you also need to have little things like bubble wrap and packing peanuts. Once you’ve purchased enough to make the move possible, you usually end up spending a shiny penny. 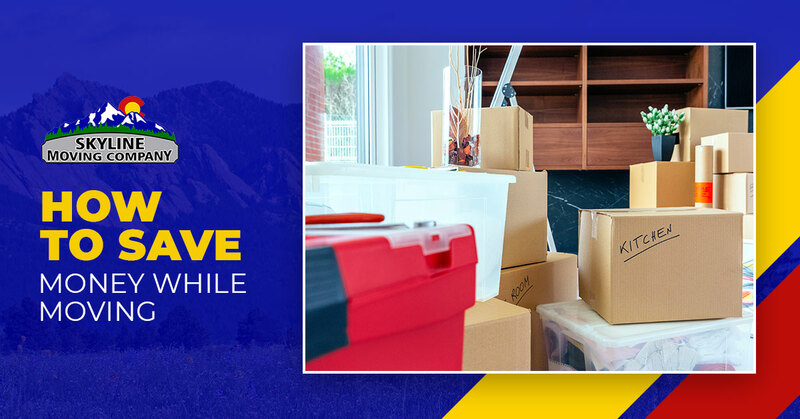 Rather than drop tons of money on packing supplies, look for moving companies that include the supplies in their cost and get double the service for a reasonable cost. Another excellent tip for moving supplies is looking for boxes that people or businesses are giving away for free. They may not all be uniform, but that definitely helps you save some money here and there. One of the best things that you can do to not only minimize the number of items that you need to pack but also the money that you’re spending is to downsize your belongings. This truly is beneficial for a number of reasons. For starters, anything that you are able to donate is something that can be written off on your taxes, which is a huge win! Secondly, the less that you have to pack, the less supplies you’ll need. This saves you money and time, both of which are extremely valuable during a move. Taking a weekend or two to do this before you move is something that we strongly suggest and know that you’ll be thankful you took the time to do once the move has come and gone. There are so many different moving companies that you can choose from, and each one has something unique to offer you. Regardless of if you’re in a rush or not, it’s always good to shop around. There are plenty of companies that will pitch you fast services, but at what cost? At the same time, there are various companies that will offer low prices but have horrible reviews. Though we completely understand the stresses of moving and the urgency that can come with hiring a moving company, give yourself enough time to really do some research. This time that you spend could be exactly what you need to find a quality moving company that provides you with high-quality moving services and does it at a reasonable cost. Hiring a full-service moving company, like Skyline Moving Company, can be extremely beneficial. We’ve been able to provide the state of Colorado with high-quality moving services that make the process easy. From packing up your belongings and loading them into the truck to making the drive and unloading, we’ve got you covered. If you’re interested in learning more about the packing and moving services that we offer or you’d like to get a quote on your move, call us today. We’d be more than happy to provide you with some insight and guidance on what your move could look like.